6.61 points at 38 votes (rank 465). It is an arcade game which was very popular on the video game machines in the 80s. 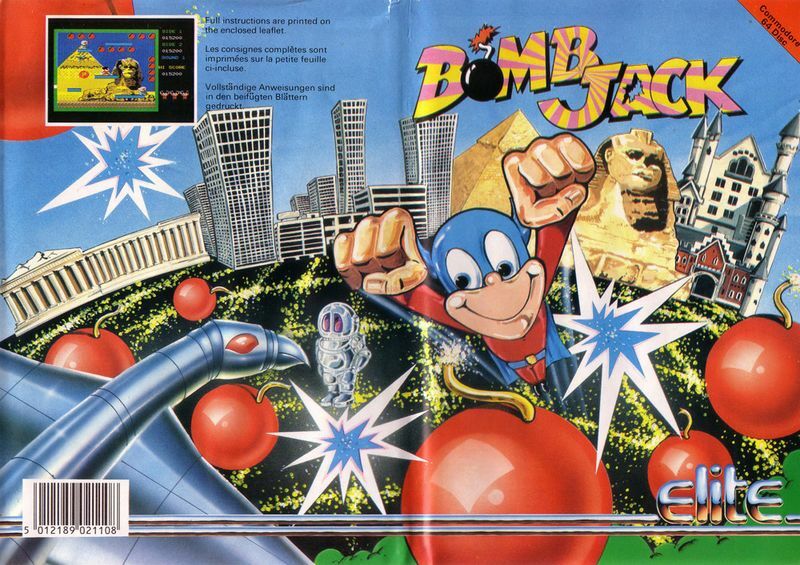 The player controls the super hero Jack and tries to deactivate bombs. If all bombs are touched in a certain order, the player receives bonus points. The right order is marked by blinking bombs. Various enemies as robots, ufos and vultures move over the field and subtract a life from the player when they touch him. After a certain time or a certain number of points, flying, circle shaped extras appear, which need to be collected to get activated. There are each 5 different background screens, where -except the 5th screen- there are always platforms. In higher levels (from level 6): The number and speed of the enemies rises and the accessibility of the bombs is aggravated by walls and additional platforms. P: The enemies turn to faces for some seconds, which can be collected (and for this time are also harmless). 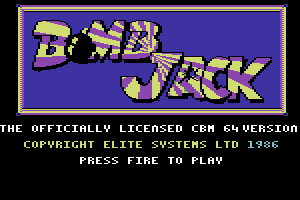 In Bomb Jack you move in each level on a non-scrolling screen. The graphics is multicoloured and for every level there are background graphics, that display a famous place (e.g. the Sphinx). The enemies move very fluently the same as Jack himself, with whom you can also flutter a bit in the air once in a while. The animations are designed well. The collision query does not start right away when Jack appears. Therefore it is often possible to touch the enemies while they appear without getting harmed. During the game a melody is constantly played in the background. This changes when you catch the "P" and the enemies get harmless. When the level is over another melody is played. In doing so Jack dances a bit. It depends on the first collected bomb which bomb needs to be deactivated first: The order itself is the same in the level, but the starting point can be chosen freely by this. The version by "Remember" contains next to the manual and a storable highscore also the following "trainer": unlimited lives, no collision query with the enemies, with "C=" key to the next level. Werner: "In my opinion this game is too difficult. However, it gets 8 points from me." Jodigi: "Finally a 1:1 conversion of an arcade game. It is a very good game, in the video game machine as well as on the C64." Robotron2084: "I'd say it is NO 1:1 conversion from the machine, as the sprites are at least twice the size of the amusement arcade model, which makes the targeted collection of bombs a matter of luck and calls up unnecessary frustration. Also does Magnetic Fields 2 as background music -although it might be nice- not correspond to the original. Without the oversized sprites the game would be a big hit, so I give it 7 out of 10 points." Goondoc: "This amusement arcade conversion is no way 1:1! A very decisive mistake was made, which unnecessarily aggravates the game. This is the upper edge. It is too low down or the two upper platforms are to far up respectively, so getting through (jumping over) while the platform is occupied (robots) gets impossible. This is different on the arcade machine and simplifies collection the bombs in the right order. However, not all levels are affected by this mistake, as the level design doesn't have platforms at that height everywhere." Shakermaker303: "I don't know the arcade machine version and vote without prejudice. It is partially really a bit hard because of the big enemies. On the other hand it s designed rather well, the music is ok and the steering is quite funny. I had my fun with this game and give it 8 points." Camailleon: "The game reminds me of the evenings of playing with my dad, when I was little, where we outbid each others scores again and again. 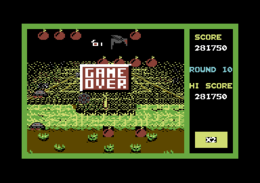 Also I don't know the arcade version and therefore I can only say something about the C64 version. And this is lots of fun!" 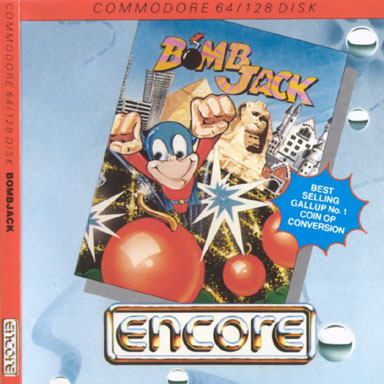 Bomb Jack in the Killer List Of Videogames. This page was last modified on 4 April 2016, at 21:47.